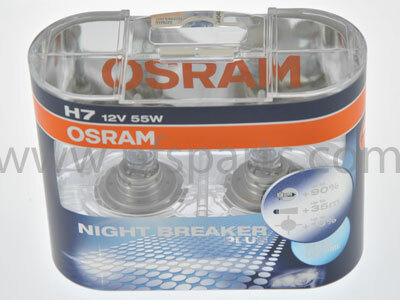 Osram Nightbreaker H7 Bulbs - up to 90% more light. New from Osram - Night Breaker delivers up to 90% more light on the road for optimum visibility and safety and a 10% whiter light for minimal glare and optimum comfort. The top product for active and safety-conscious drivers. With its new NIGHT BREAKER™ family of lamps, OSRAM is breaking records for the power and colour of headlights. Compared with standard lamps, they shine up to 90 % more light on the road and produce 10 % whiter light. Their maximum performance make NIGHTBREAKER™ lamps particularly attractive for active and safety-conscious drivers. Improved illumination of the road provides optimum visibility and therefore optimum safety. NIGHT BREAKER™ lamps also make driving more comfortable. Drivers find the whiter light stronger and more pleasant than ordinary light, which is of great benefit on long journeys. This product is sold as a pack of 2 bulbs.